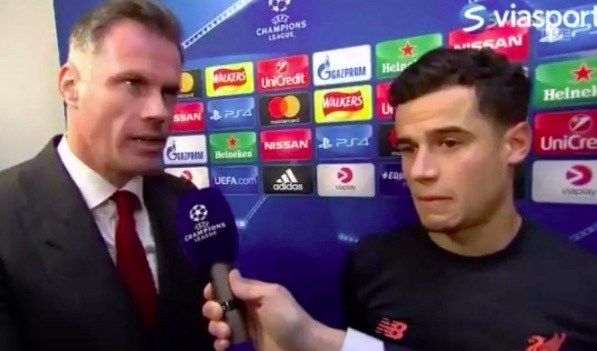 After the game last night, Coutinho gave an interview to Jan Aage Fjortoft of Viasport Fotbal, which wasn’t shown on BT Sport or any of the English coverage on ITV later on. The Brazilian seemed in much better spirits than he did on the pitch, smiling alongside Jamie Carragher, although it might have been out of uncomfortableness! Coutinho had just scored a hat-trick and left with the match-ball after a scintillating performance, of course. But after Carragher’s phone went off, the interview took a different turn, with Fjortoft immediately asking if it was Barcelona calling. “No, he’s staying!” Carragher responded, before declaring, in front of Phil, that our progression should help him stay at the club. The interviewer then turned to Coutinho, with the topic of Barcelona still fresh in the air.
.@Carra23, is that Barcelona calling?